The traditional full English breakfast is a centuries old British breakfast tradition, one that can trace its roots back to the early 1300's. In one form or another, the tradition of a uniquely English breakfast is one that has been proudly sustained over the centuries by different generations of British society. Today the English breakfast is more popular than ever and you can usually find an English breakfast in most towns and cities across the country and overseas wherever you find the British. The tradition of the English breakfast first began with the Gentry, before then being adopted by the Victorians who refined the tradition into an art form. Then came along the the Edwardians who standardised the ingredients, giving us the English breakfast that we mostly eat today and in doing so, created a truly a national breakfast tradition and an icon of British culinary culture. The idea of the English breakfast as a national dish, stretches back to the thirteenth century and an English institution called the gentry, who considered themselves to be the guardians of the traditional English country lifestyle and who saw themselves as the cultural heirs of the Anglo-Saxons. 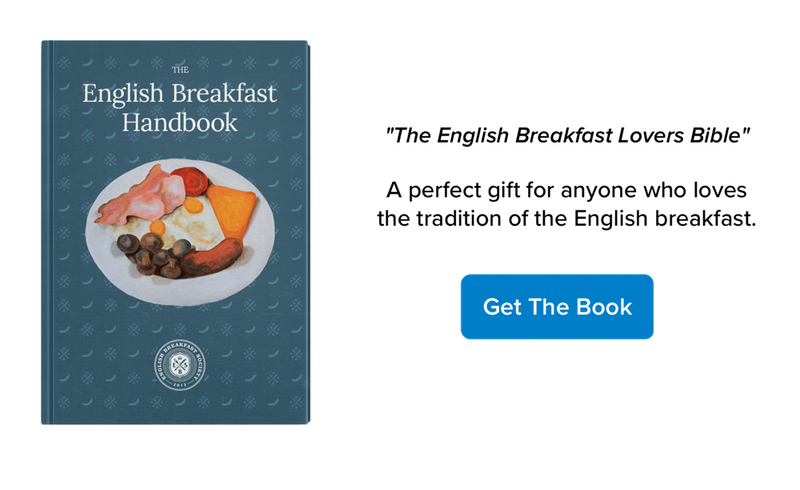 The story of the English breakfast begins in the country houses of the English gentry, with their notion of what constituted a proper Anglo Saxon breakfast and their tradition of social hospitality. The gentry were considered to be a distinct social class, made up of those with 'noble and distinguished blood', landowners and 'genteel' families of long descent, this privileged layer of society also counted senior members of the clergy and the relatives of titled families within its ranks. The gentry saw it as their duty to keep alive the practices, values, culture and cuisine of the traditional Anglo-Saxon country lifestyle. The great country houses of England, owned by members of the gentry and the centre of huge country estates, were important hubs of local society where breakfast was considered to be the most important meal of the day and a very important social event. The gentry were famous for their breakfast feasts and in the old Anglo-Saxon tradition of hospitality, used to provide hearty full breakfasts for visitors passing through, friends, relatives and neighbors. They liked to indulge in 'full English breakfasts' before they went out to hunt, before a long journey, the morning after their regular parties and also when welcoming new arrivals to the estate. The breakfast table was an opportunity for the gentry to display the 'wealth' of their estates in the quality of the meats, vegetables and ingredients produced on the surrounding lands. It wad also a chance to show off the skills of the cooks who prepared a selection of typical Anglo Saxon breakfast dishes for the residents and guests of the house to choose from and graze upon. Breakfast served in these country houses was a uniquely English affair, the ingredients prepared using Anglo Saxon recipes and methods, the breakfasts made up of traditional Anglo Saxon dishes and it was here, on the breakfast tables of the gentry, that the idea of the traditional English breakfast began. By the time Queen Victoria came to the throne, the gentry as a social class were in decline and a new wealthy class made up of merchants, industrialists and businessmen was emerging. The Industrial Revolution and the British Empire at its height were fantastic creators of wealth and the newly rich saw the idea of the gentry as the social model to aspire towards. Those seeking to advance themselves socially studied the habits of the gentry, the traditions of their country houses and enthusiastically adopted their notion of the English breakfast as an important social event. For aspiring and wealthy Victorians, breakfast became an opportunity to demonstrate your wealth, good taste and social upbringing. It is the Victorians who took the tradition of the Anglo Saxon gentry breakfast and raised it up into an art form, going to great lengths to secure the more exotic and traditional ingredients and have them prepared in the right way. Like many great Victorian traditions, the serving of the traditional English breakfast and its presentation was a refined and elegant affair. If you are ever lucky enough to be served breakfast in this way, you will find it easy to understand why the Victorians thought of the traditional English breakfast as the most civilised way to start their day. The Edwardian era is known as the golden age of long leisurely breakfasts and garden parties, basking in the sun that never set on the British empire. Leading up to the First World War, it was during this period that we first saw what we would recognize as an English breakfast begin to emerge and be served as standard in hotels, bed and breakfasts, on trains and at meetings across the country. Standard ingredients made it easier to prepare and so the 'common' English breakfast rapidly spread nationally, its standard ingredients of bacon, eggs, sausage, black pudding, baked beans, grilled tomato, fried bread and toast, served with a jams, marmalades, tea/coffee and orange juice. The English breakfast was not just a meal for the wealthy at this point, the middle classes began to eat a full English breakfast on a regular basis and began seeing it as a traditional family meal. They thought it sensible to eat a full breakfast before starting the day, one that provided an increasingly mobile workforce with the energy that they needed to see them through a full days work. The English breakfast tradition spread from the middle to the working classes and reached its peak in the early 1950's when roughly half of the British population began their day by eating the same English breakfast we would eat today, collectively turning what was once a meal for the wealthy upper and aspiring middle classes into a truly national breakfast dish and working class staple. The English breakfast was famously served in what used to be called greasy spoon cafes located on industrial estates and close to ports, commercial, manufacturing and industrial centres where all the workers were. For a long time these were the best places to get a real English breakfast, one cooked and served by real English working class people, but over the last few decades they have fallen into decline along with British industry and manufacturing and real greasy spoon cafes are now rare. For more than two centuries, the tradition of the full English breakfast has been enjoyed across the full spectrum of British society and it for this reason that the traditional full English breakfast is still being served to this day in family kitchens, hotels, bed & breakfast's and pubs throughout Great Britain. Known colloquially as a fry up, the ingredients of the English breakfast are now standardised, but there is currently a revival of the more traditional English breakfast ingredients underway in higher end establishments, where the English breakfast is once again being revered and raised into an art form, typically via the inclusion of some of the older and harder to prepare Anglo-Saxon breakfast dishes. The 'common' full English breakfast is a substantial meal consisting of back bacon, eggs, British sausage, baked beans, fried tomato, fried mushrooms, black pudding, fried and toasted bread. These ingredients may vary depending on where in the Great Britain you happen to be and are a subject that is still open to (sometimes quite fierce) debate, we acknowledge this, so please stop writing to us saying that they are wrong, these are the right ingredients in our learned opinion. The Southern English however would tell you that black pudding is something that was inherited from the Scottish, but the truth is that in the North of the country black pudding is widely consumed and viewed as an essential part of the traditional full English breakfast. Hash browns however are a controversial ingredient that many believe do not belong in a traditional English breakfast. We here at the Society believe that hash browns and french fries are used as a cheap breakfast plate filler in badly run cafes, by people who have no respect for our traditions. The regional variants, like the Scottish/Irish full breakfast, are usually exactly the same dish with slight changes to the ingredients, depending on the regional tastes and preference of the locals. The full Irish breakfast usually contains Irish bacon and sausage, but also traditional regional ingredients such as white pudding, Irish soda bread and Irish potato cake, whereas the full Scottish breakfast usually contains local ingredients as black pudding or a slice of haggis. The meat ingredients were traditionally sourced from local farmers and made using a local recipe. If you travel all over the country and eat a traditional English breakfast wherever you go, you could explore the rich diversity of sausage, back bacon and black pudding recipes from across the land. Each region of Great Britain had a breakfast that contained pork which had usually been raised in that region, and some regions are famed for their bacon and sausage, famous British sausage producing regions of note are Lincolnshire & Cumberland, but many other parts of the country have also produced their own sausages, black pudding and bacon for centuries using their own local recipes. As we mentioned earlier, we stuck to the 'common' ingredients in our description of the English breakfast, but traditionally it contained much more than those commonly found ingredients. But these days it is hard to find these traditional and hard to cook breakfast ingredients being served. 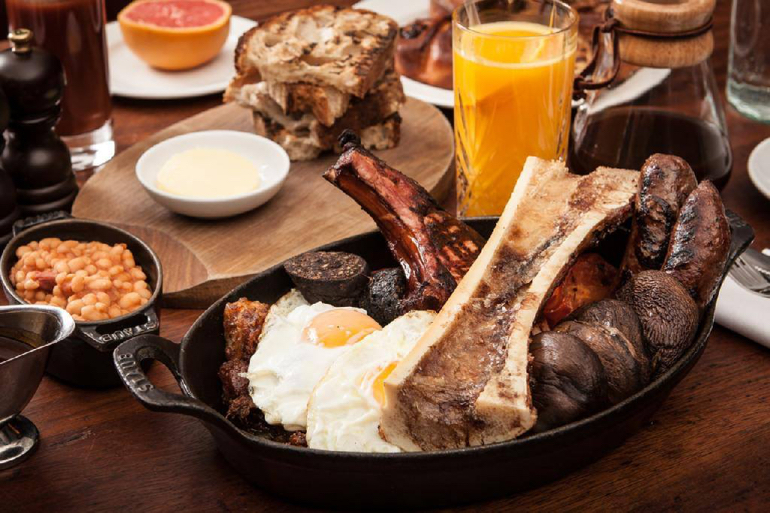 If you wanted to be more decadent and treat yourself, you can add bone marrow, pork crackling, a huge pork chop and and home made baked beans to make a truly full English breakfast feast. For the connoisseur of the traditional English breakfast, the regional differences in the pork ingredients add variety into the tradition, but if you wanted to add even more tradition, try adding Anglo Saxon dishes like baked halibut steaks, fried whiting, stewed figs, pheasant legs, collared tongue, kidneys on toast, sausages with fried bread, pigs cheek and Melton pork pie to your spread. Do not be fooled by mention of the word 'breakfast' in all of this, its presence does not necessarily mean that the traditional full English breakfast must be eaten at breakfast time, it is such a substantial a meal that it can be enjoyed at any time of the day. If you are anything like the members of this society, you sometimes eat your English breakfast around lunchtime and sometimes for dinner. 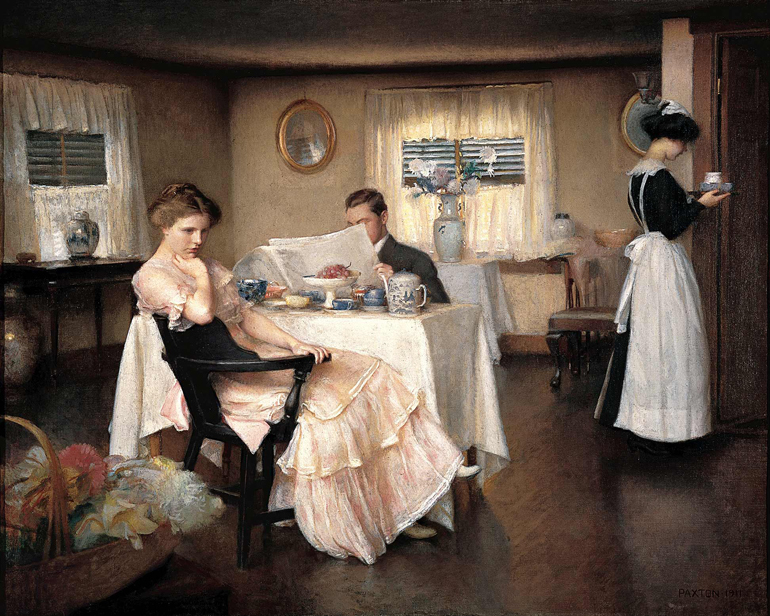 Even though the traditional English breakfast is served at family and social gatherings, it is culturally acceptable to ignore the other occupants of your table whilst you eat your English breakfast and read your newspaper, please do not be offended if the person you are eating your English breakfast with ignores you, other than to comment on what he or she is reading, this is part of the tradition. It was traditionally during the eating of the English breakfast that the British would acquaint themselves with the current affairs of the day, an important part of the tradition. The traditional English breakfast is not only a national dish, but also part of the British cultural fabric and typically the very best English breakfasts are served by our mothers and made with love. We hoped you enjoyed our article on the history of the traditional English breakfast. If you did, please show your support for the tradition by sharing this article with your friends using the buttons below !